New families these days aren’t buying minivans. The minivan has had a reputation of a lame car over the years, and this year Honda is setting out to change that. The new 2018 Honda Odyssey has revealed its new design. Honda has fully overhauled and redesigned the Odyssey. 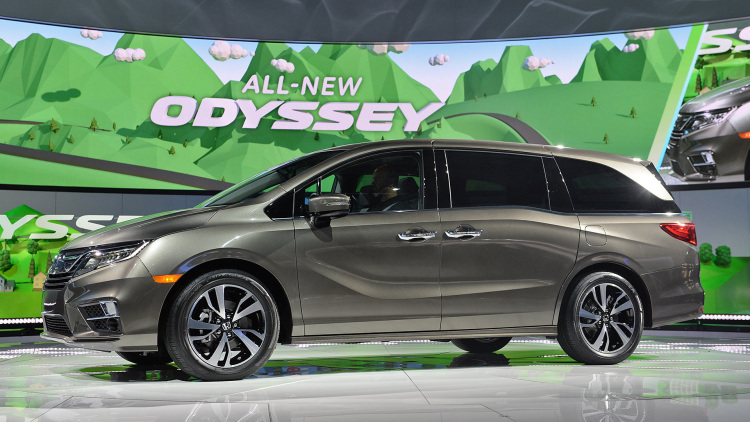 If you’re in the market for a new minivan, the new Honda Odyssey promises big things giving it the potential to be the next best thing for your family. Check out the highlights of some of the biggest changes that Honda has made to the minivan. One of the most noticeable differences within the design are the changes to the hood, and a new grille featuring a silver bar. The bar connects the Honda emblem to the headlights on the front. This new design is similar to the other new Honda products from 2017 and 2018. The door handles have been positioned farther apart compared to other models, and they have new C-shaped taillights. The taillights are also now separated by a horizontal bar, instead of attached together as they have been in previous designs. The new 2018 Honda Odyssey features a new 7-inch digital instrument cluster, which is replacing the previous infotainment setup which had dual screens. Now, one single screen sits at the top of the dash. The interior now also features an electronic gear selector instead of a traditional lever. The seating is now more versatile than ever in the new Odyssey. The middle section can be positioned farther forward (this is a great feature if you’ve got small children, as you can position them closer to the front seats for easy access). The two seats can also be pushed together or separated as you wish. They can be shifted and moved for better access to the third-row seats if necessary. This second row is referred to by Honda as Magic Slide seats. With the 2018 Odyssey, Honda has introduced new technologies called CabinWatch and CabinTalk. CabinWatch is an infrared camera located in the overhead rear-seat0 entertainment system, which provides the driver and front seat passenger with a view of what’s going on in the back seats. The camera feeds into the dashboard’s display screen, and through that screen, the feed can be zoomed in on. CabinTalk allows the driver to speak into a microphone which can be heard via rear speakers, or through the entertainment system in the back seats. These features are great if you’ve got a minivan full of kids, so you can talk to them and keep an eye on them. The Odyssey also features a rear-seat entertainment system, which can stream PBS Kids, iHeartRadio, and Spotify apps on a new 4G LTE WiFi connection. There are more apps, like Social Playlist and How Much Farther? which can be used through this entertainment system for the rear seat passengers. These features for the new 2018 Honda Odyssey make for a new minivan ideal for families. With its adjustable seats and new technologies, the Odyssey is the ideal choice if you have multiple kids and you’re in the market for a new minivan.